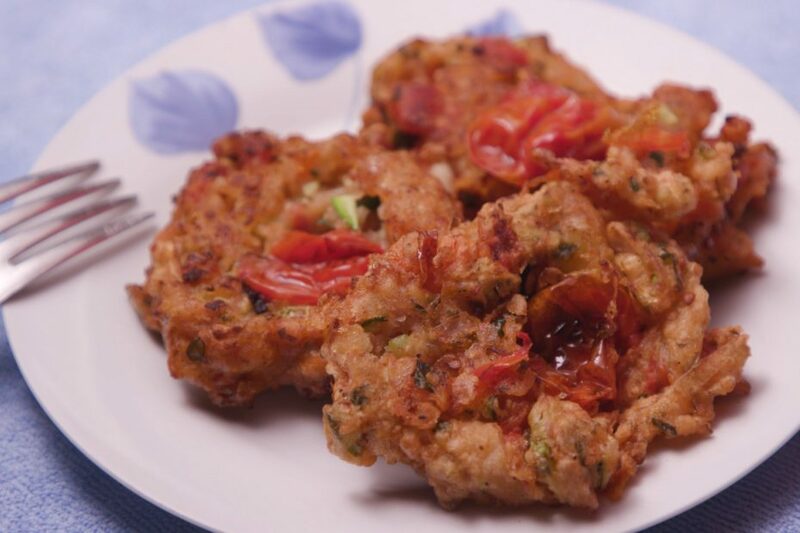 Santorini tomato fritters are one of the flagship recipes of Greece's most popular tourist destination. This authentic recipe, from season 1 of My Greek Table, is enriched with flaky cod. To find some of the artisinal Greek products you'll need to make this, visit my online shop here, where you'll discover a host of lovingly curated Greek ingredients. Break up the cod into pieces about 2 inches / 5 cm square. Place in a bowl and fill with cold water. Refrigerate, changing the water every few hours, for 24 to 48 hours. Remove and break apart into shreds. Set aside. Chop the onions and scallions and place them in a large bowl. Add a scant teaspoon of salt and knead the onion-scallion mixture until soft. Add tomatoes whole. Cut the zucchini into quarters, lengthwise. Using a paring knife, remove and discard any seeds. Coarsely chop the zucchini and add it to the onion-scallion-tomato mixture. Add the chopped basil and dried mint. Chop up the shredded cod and add that, too, to the mix. Season to taste with additional salt and pepper. Knead the mixture, adding enough flour as you go to form a dense mass that holds its shape on a spoon when scooped up and held upside down. Over medium-high heat, heat 2 inches / 5 cm corn oil in a large, deep skillet or wide pot to 350F/176C. Take a teaspoon at a time of the mixture and, using a second teaspoon, slide the mixture into the oil. Do this in batches, filling but not overcrowding the pan. Fry for about 2 minutes, turn and fry on the other side, and remove with a slotted spoon when nice and golden. Drain on paper towels and serve.